Inishowen Tourism showcased the Inishowen Peninsula off in style on the 18th & 19th of November. Diaspora and Tourism professionals from many corners of the world travelled to Inishowen to participate in the two day familiarisation trip ‘Come experience the Northern Lights’. We welcomed our Diaspora guests, Travel Writers, Tour Operators, representatives from Fáilte Ireland, and also Tourism Ireland. At the opening reception Minister Joe McHugh joined Siobhán Kelly, the Marketing Manager at Inishowen Tourism in welcoming everyone to the area. The evening proceeded with a fantastic presentation of the Northern Lights by Adam Rory Porter. Gerard O’Kane of Donegal Photo Tours, Mark McLaughlin a member of the Buncrana Camera Club and Brendan Diver of Photos from Ireland, were also present. The gentlemen gave a great insight into how to prepare for your hunting, what a equipment you’d need to capture the Aurora Borealis and where to find the essential information before heading out on your adventure. Luck was on our side that night and all the factors indicated there was a great chance of an Aurora Borealis display. The KP was above 5 which meant there was a high possibility of capturing a glimpse of the Northern Lights with the naked eye. 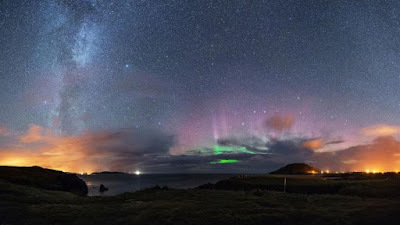 The entire group jumped on the bus and headed to Dunree Military Fort in the hope of seeing those Northern Lights dance through the Inishowen sky. Our Luck had left us on arrival to Dunree and due to cloud cover the Northern Lights were nowhere to be seen. However a great night was had by all and there was a great sing song on the bus on the way back to the hotel. The trip was concluded with a fantastic night of entertainment at the well renowned Celtic Feast at the An Grianán Hotel. Tourism trade in Inishowen and across Donegal and Derry were all invited to attend giving them an opportunity to network with the Diaspora and tourism professionals. Through the evening individuals learned the history surrounding the Grianán Fort through story, music and dance. While enjoying the entertainment a feast fit for a king was served. The two day Diaspora event was a great success with all participants giving wonderful feedback on all aspects of their trip. They returned home inspired by Inishowen’s natural beauty, hospitality and with warm hearts from their enjoyable experience. We look forward to working alongside these tourism professionals in the near future creating itineraries to welcome new visitors to Inishowen.